About | The Killer Robots! 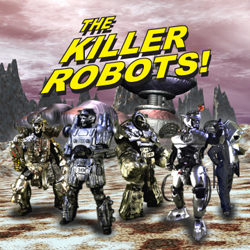 The Killer Robots! is a multimedia project encompassing music, movies and the web. It was formed in October of 2004 when bassist Sam Gaffin recruited guitarist Samuel Williams and keyboardist Mike McGowan to create a theatrical rock band in the tradition of GWAR, KISS and Alice Cooper. Combining their love for music, comic books and old Sci-Fi movies, the trio set about building costumes, practicing and looking for a Drummer. April of 2005 Charles Harris signed on as a most unlikely drummer – Trog. With his gigantic fists and caveman mentality, Trog would demolish his drum set within the first song. The Killer Robots played their first show in June of 2005 and quickly became known for their anarchic stage shows and goofball music. The Killer Robots knew they were on to something and organized a guerilla theater troupe for every show they played in order to handle the chaos. With this guerilla troupe in place the group’s well-known antics became systematic and organized. Monsters began to interact with the crowd. Audience members were given foam weapons with which they could participate in the battle with the monsters. Candy exploded from the head of Monko the Gladiator and Vicious Mosquito while Space Blob filled with air and threatened to envelope the audience. Mer-Monkey and Rock lobster battled it out on the floor while Trog refereed. Confetti cannons fired away with the arrival of Abraham Lincoln. Over the next year and a half the Killer Robots honed their stage show and opened for such diverse national acts as the B52’s and muscle rock legend, Thor. 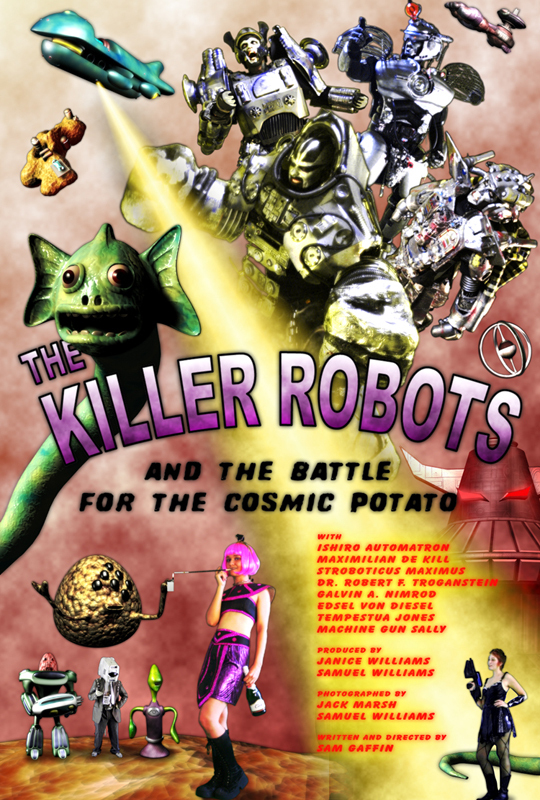 2009 saw the release of The Killer Robots’ first album “The Killer Robots!” and the premiere of “The Killer Robots and the Battle for the Cosmic Potato” feature film. In recent years the Robots have concentrated their energies on a new feature film involving hundreds of puppets, models and costumes. That film is called The Killer Robots! Crash and Burn and can be found on iTunes, Google Play and Amazon Video. 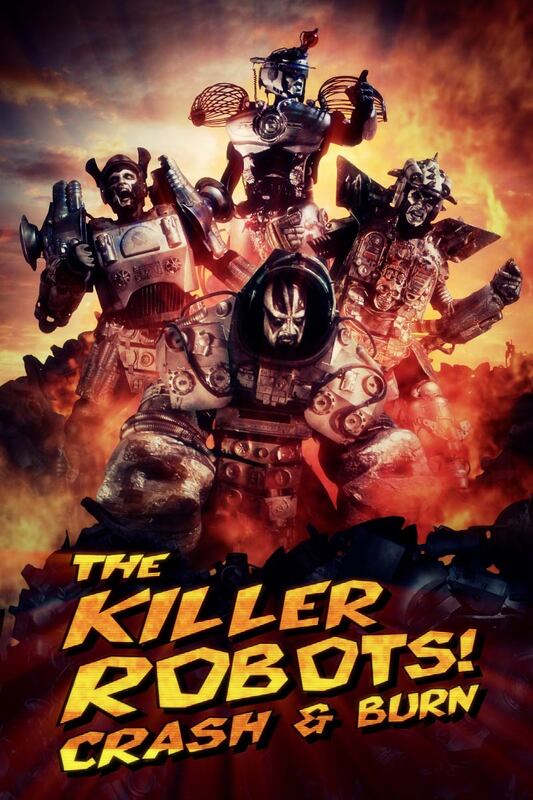 As of 2016 The Killer Robots are in the thick of promoting their new movie, producing the soundtrack and DVD, and gearing up for a follow-up. I would gladly organize a sign up sheet to rent a screen at my local movie theater. I think they said something like if you can guarantee at least 100 people will show up they will air any movie. With my group of friends it should not be that hard.